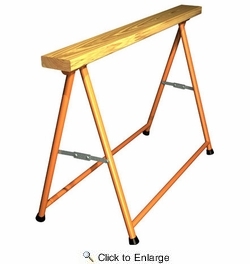 Grabber FNG Fold N' Go Pro Model Sawhorses - Pound for pound, the strongest, most versatile sawhorse money can buy! Folds and goes anywhere. 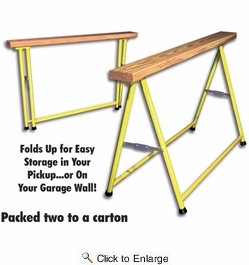 Folds up for easy storage in your pickup or on your garage wall! Comes fully assembled. Only 13 lbs. each. Dimensions: 32" height, 36" length, 3" width. Holds 1,600 lbs of material used in pairs. Designed specifically for professional contractors. Ideal for professionals and DIY. Grabber Sawhorses meet OSHA Requirements. Meets or exceeds requirements of ANSI Code A10.8. Sold in Pairs.